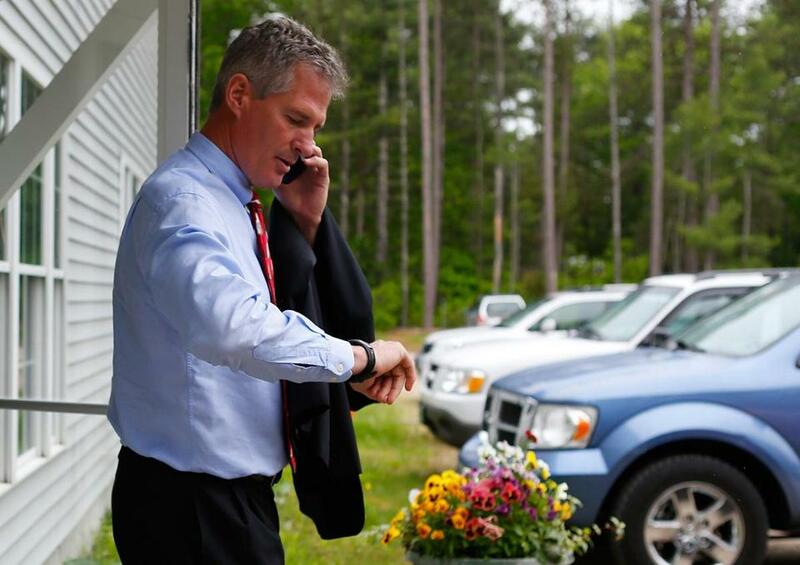 Former senator Scott Brown has said he will relinquish 1.5 million shares of Global Digital Solutions stock. When former Massachusetts senator Scott Brown was named last September as an adviser to an obscure Florida company, Global Digital Solutions Inc., the chief executive announced that Brown would offer “invaluable advice and guidance” on its upcoming merger with a small firearms company. A month later, the news got even bigger. Global Digital announced that its pending new partner, the struggling firearms company, had an agreement worth an estimated $95 million to sell grenade launchers to an unnamed client. But the head of that arms company, Airtronic USA Inc., later declared in a court document that there was no $95 million order. The value of all of Airtronic’s pending orders was $1.3 million, she swore in a court statement. And she said the press release quote saying she was “thrilled” about the deal was made up. It is unclear what role, if any, Brown played in the press release and failed merger. His office declined questions Thursday. “Your conspiracy theories and assumptions are completely wrong,” Brown’s communications director, Elizabeth Guyton, said in response to queries. She did not elaborate, and Brown would not agree to an interview. During a campaign event Thursday, Brown’s campaign refused to make him available for questions and hurried him into a car. In recent days, Brown has said he was a “sounding board” for the company, but not involved in day-to-day activities. Brown, who is seeking the Republican nomination for the US Senate seat in New Hampshire, resigned Wednesday from the company and said he would relinquish his 1.5 million shares of its stock after he was bombarded with questions about his involvement in the Florida penny stock, saying it was becoming a distraction. In comments earlier this week, Brown called the company a “legitimate” start-up. Executives from Global Solutions did not respond to an interview request and e-mailed questions on Thursday. The Globe reported last Sunday that Brown received stock initially worth $1.3 million to join the advisory board of the firm, which has no revenue, no products, no trademarks, no patents, and only a “virtual office.” The stock has since declined by more than half. Originally founded in 1995 to sell beauty products, Global Digital morphed into a wireless data company before repositioning itself last year as a weapons maker. Accountants who have looked at the company have said it was a risky investment. Global Digital has announced a series of acquisitions that have not been completed. Among them was an announcement in March that it intended to buy Remington Arms Co. LLC, one of the world’s largest gun manufacturers, for more than $1 billion. That was greeted with derision by Remington and others in the industry. Global Digital has just four employees, and a market value of about $40 million. But the complaint about the Airtronic press release — and the company’s boast about $95 million in pending agreements — raises fresh questions about whether Global Digital misled investors, and it could draw attention from the Securities and Exchange Commission, according to lawyers who specialize in securities. “If those statements aren’t true, there’s the possibility for a securities fraud case to be brought,” said Thomas A. Sporkin, a former SEC enforcement official, now in private practice with BuckleySandler in Washington. Global Digital announced on Sept. 9 that Brown was coming on board as a senior adviser, highlighting his importance to the pending Airtronic merger. While it was not known then, Brown was given stock initially worth $1.3 million in exchange for his service. At the time, Global Digital was trying to reinvent itself as an firearms company, and Airtronic was a small arms company trying to emerge from bankruptcy. “I personally look forward to benefitting from Scott’s invaluable advice and guidance with regard to the Airtronic merger and our overall strategic direction,” Global Digital’s president, Richard J. Sullivan, said in the press release. A month later, on Oct. 8, Global Digital announced that its merger partner had a $95 million deal to sell grenade launchers, and investors touted the press release on the stock message board. The stock jumped 8 percent. It would be several days before Airtronic’s chief executive and owner, Merriellyn Kett, would even see the press release, after she was told about it by a supplier, she later said in a sworn statement. “I am not aware of any basis that could render the statements in the press release truthful,” Kett said in a Nov. 25 declaration to the bankruptcy court. Kett said she later asked Global Digital’s chief executive for an explanation, but Global Digital repeated the claim about the $95 million deal in another press release a week later. It is unclear where the $95 million figure came from. In court documents, Sullivan said Kett “had no basis for complaining” about it and that she had agreed to the release of similar announcements about the deal (without the dollar figure). Sullivan also pointed to an e-mail Kett sent him in September 2013 discussing a $307,000 order for grenade launchers. The gun company, Airtronic, terminated the merger with Global Digital and recently emerged from bankruptcy. As part of an agreement with the company, Airtronic last month repaid Global Digital $1.5 million that had been lent, according to a bankruptcy court filing. Global Digital also agreed to remove all references to Airtronic from its website. It even amended the press release announcing that Brown would join the company as an adviser, removing Airtronic’s name. Though Global Digital settled its dispute with Airtronic, it is suing the chief executive, Kett, individually, for $90 million for refusing to close the deal. Citing the ongoing lawsuit, Kett and her lawyer declined to comment for this article. Richard M. Gelb, a Boston lawyer who handles securities cases, said he believes the press release would violate securities laws if it contains significant misstatements. In this case, he said that Kett’s affidavit raises serious questions about whether the press release was accurate and could prompt government regulators or lawyers representing shareholders to investigate further. “I would assume a regulator would take steps to determine why the press release and affidavit contradict each other,” said Gelb, a partner of Gelb & Gelb LLP, who reviewed the press release and affidavit. In explaining why she wanted to call off the merger with Global Digital, Kett also said in court documents that the company failed to secure approval for the merger from federal regulators or disclose that Sullivan and his business partners have been the subject of several shareholder lawsuits involving separate companies, including one settled in 2004 for $5.6 million. The Florida attorney general’s office said it has received no complaints about Global Digital. The SEC, the main agency that investigates securities fraud, said it could not say whether it has received any complaints about the company or has any active investigations into the firm. Globe correspondent Faiz Siddiqui contributed. Noah Bierman can be reached at noah.bierman@globe.com. Todd Wallack can be reached at todd.wallack@globe.com.